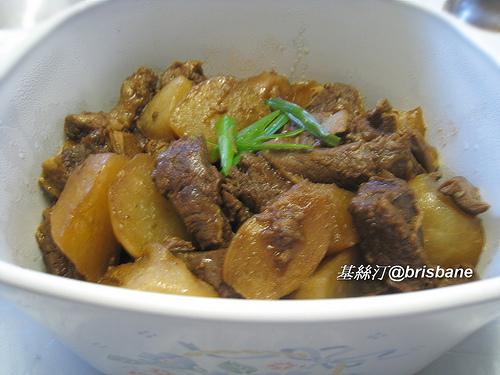 Stewed Beef Brisket in Chu Hou Sauce (柱侯蘿蔔炆牛腩) is a very popular dish in Chinese family cooking. It suits to serve in whatever seasons or any occasions. Sometimes I deliberately cook this dish in double size and reserve the other portion in fridge as a quick lunch the day after. The soul ingredient of this dish is the Chu Hou paste (柱侯醬) that is mainly made of soybeans, garlic, ginger, sesame seeds and many other spices. Thus this convenient sauce can make the beef brisket taste heavenly delicious. Any Asian store will stock it because it's commonly used in Chinese cooking. It goes perfectly with steamed rice or noodle soup. The beef brisket would absorb all flavors and taste wonderful and more delicious. 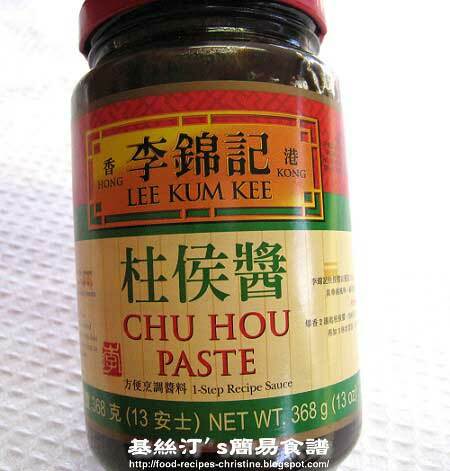 Chu Hou paste (柱侯醬) is also available at Amazon. Add beef brisket chunks into boiling water to blanch for 3 minutes. Remove and drain. Peel daikon and cut into chunks. Set aside. Heat wok on medium heat, add 2 tablespoons of oil to sauté ginger and Chu Hou paste till aromatic. Put in beef brisket chunks and stir well. Add star anise and a bit of rock sugar with water that covers all ingredients. Bring to boil, pour all ingredients into a vacuum pot (thermal pot) to cook slowly until done. Remember to heat the inner pot first to get a better result. If you don’t have a vacuum pot, here’s a good method to stew beautiful beef brisket:Cook for about 30 minutes. Turn off the heat and leave it for 15 minutes. Repeat this procedure three times. Whether you use a vacuum pot or not, when the beef brisket is done, turn on the heat again, whilst boiling, add daikon chunks and stir well. Turn off the heat and leave for 15 minutes. Then turn on the heat again and bring to boil. Add seasonings to thicken sauce to your preferred consistency. Arrange 1 or 2 pieces of fresh lettuce on a plate. Pour beef brisket with sauce over the lettuce. Sprinkle with chopped green onion. Serve hot. Adding a small piece of rock sugar will help to soften beef brisket resulting in a tenderer texture. I learned this trick from my mother-in-law who is an expert on stewing beef brisket. The procedures of turning on and off the heat can help to shorten the cooking time and save energy. If the beef brisket you buy are too fatty, it’s better to trim them beforehand. Here’s another trick that I’ve experimented for several times. Having cooked beef brisket chunks for 30 minutes, let them cool down and put in a fridge for 3 hours. The fat would become solid and can be easily removed with a spoon. Stewed beef brisket would be one of those dishes I've tried but never really knew how to make. Thanks for sharing this and I would try it for one of my bentos now that it's almost fall. Thanks for sharing! Same to us! It's one of our family's favorites. I tried this recipe over the weekend and it was SO FANTASTIC and so great over rice! Thanks for sharing. Will you be posting any more "stew" like recipe? Oh, that's good news. Congrats! Yeah, I like stewing food also, especially in winter and did some. Once I've got time, I'll post them up here. BTW, do you read Chinese? I posted some recipes of stewing meat, you can head over there and have a look. I wish I did. I was the one that asked you to translate the pork adobo recipe. I will definitely keep checking back on your blog for more of the stewing recipes. In the meantime, I'll be trying out your pork recipes. Thanks again for sharing! I love these easy to follow Chinese recipes. i made this one the other night tooooo!! wasa yumi and my bf loved it too. thnks so much!! Should I leave the lid on or off? Should I put all 2 litres of water in while cooking? Mine turned out watery but tastes good. Please advice. Thank you! Keep the lid on while cooking if you can because the beef brisket could be softened easily in that way. If your dish was too watery, it could be the heat of your stove was lower than mine. Try to cook longer time and let more water be evaporated and reduced. Or you just add less water to cook next time. I think the smell and taste of the whole star anise are more natural. You can try the powder anyway. You can also subscribe to this blog, then you won't miss any updates. I tried this recipe and it was sooooo yummy! Thank you for your awesome site! I've made so many of your recipes and they always turn out amazing. Your pictures are beautiful as well and you post all the great classic Chinese dishes that I am always on the lookout for. I've posted about my experience cooking this on my blog if you'd like to have a read =). Thanks again for a really amazing recipe! Do you think I can use a slow cooker to stew the meat? If so how long would I leave it in there? Thanks! If you use slow cooker, it should take a few hours too. But you can test the beef with a chopstick, if it easily go through it, then it's tender enough. Hi Christine! Your recipe's sound very interesting and I would love to try em out... I have to wait til I have a full size kitchen but I'm definetly goin to suscribe to your blog... I assume you have quite a few recipes to teach me correct? Great work with your website! I'm really looking forward to making your three cup chicken - looks delicious. Keep up the great work! Fantastic recipe made this a few times already. Thanks so much for the post! My wife loved it and so do I. Will make this again!!! Bloody delicious!! Love this dish it was really like I am eating in Hong Kong. Please do post lots more recipes. We like your food. Your site has a lot of my favorite dishes. Thanks!! HI! This is my first time here on your site. I would love to try this recipe but do you have any substitute for Chu Hou paste? We do not have it here. Thanks! Pick the young radish. They are sweet and fragrant without any hard skin outside. Of course, you can use carrot instead. It might be a bit different from the traditional dish. If you like, it's ok.
Our family love this dish,but it's hard to find the Chu Hou Sauce in Singapore.Not even Lee Kum Kee sell it here. I only managed to get it when I visit Hong Kong. Wish Lee Kum Kee could start selling it here together with a recipe, to help "educate" people how to make use of the sauce. How to get a printer friendly version of your recipe? I find that it is easier to print out, and study your recipe before trying to cook the dish. Sorry, haven't got this one done coz I started from the latest recipes and have been working backward. Just got some time and installed the printer version of this recipe for you. Here you go. Thank you for this recipe! Just a quick question, if I don't have a thermal pot, is the cooking temperature, medium heat throughout the entire cooking process? Hi Cristine, what can i substitute with chu hou paste? because i cannot find one in the nearest grocery here in our place. Thanks! Hi, if i were to do this in a pressure cooker, how long would it take? I know it can take about 2 1/2 to 3 hrs on stove top so do u think i can cook it in the pressure cooker for about 1 hr? I have a pressure cooker so it will probably cut down on the cooking time. Sorry, I don't use pressure cooker. It's better to refer to the instructions on your manual. you can buy chu hou paste (koon yick brand)at the dry goods and condiments stalls in peoples park wet market, Singapore. It sure beats flying all the hong kong to buy it. This is one of my favourite dishes and I wonder if I could substitute the chu hou sauce with oyster sauce instead. I going to try and cook this for the first time today after having it at chinese restaurants all over the world for so many years. Sorry, you can't substitute the chu hou sauce with oyster sauce. They taste very differently. And I tested the Lee Kum Kee's chu hou sauce is the best. I am not sponsored to say that. It's only my personal opinion. I didn't have a vacuum pot or anything and i added more water so when I followed your instructions, I ended up getting a broth that I could eat with noodles! Actually tastes quite good! I prefer the broth than over rice =) Thanks for the recipe! Used it three times now and my boyfriend and I love it! I have been searching for this recipe and the only problem now is that I can't find the Chu Hou Paste you used for this recipe. I live in Singapore, could you tell me where you got yours? I got it from my nearby Asian store. Do you have any Asian stores near your place? Hey Christine! My husband loves this recipe and I have made it many many times using the non thermal pot method.. However, I just received one as a gift! Your recipe doesn't seem to mention how long I should let it sit in the thermal pot for. I'd love to know :) thanks in advance! I looking for the sauce too, may i know what u mean by asian stores? Oh, I meant asian grocery stores. They should stock some coz the sauce is very common. I dont have any rock sugar. Can i substitute with something else? Made this tonight. Was yum! Thanks for the receipe. To Pearl, I am also in Singapore. I found the chu hou sauce at the wet market in Chinatown. But not lee mum kee brand. It was koon yick brand. Rock sugar is to help shorten cooking time and make the beef brisket turn soft quicker. If you don't have rock sugar, you can skip it though. I can't find anything other than rock sugar will bring out the same effect. How long do I need to keep it in the thermal pot for? Different brands of thermal pots might perform differently. Mine takes about 3 to 4 hours. If you take the inner pot out and cook for a while, then the cooking time will be shortened. i was wondering, do we put the rock sugar in every time we heat again for 30 mins to make the meat even MORE tender? or just once is good enough? No, only add rock sugar once, otherwise, your dish will be too sweet.